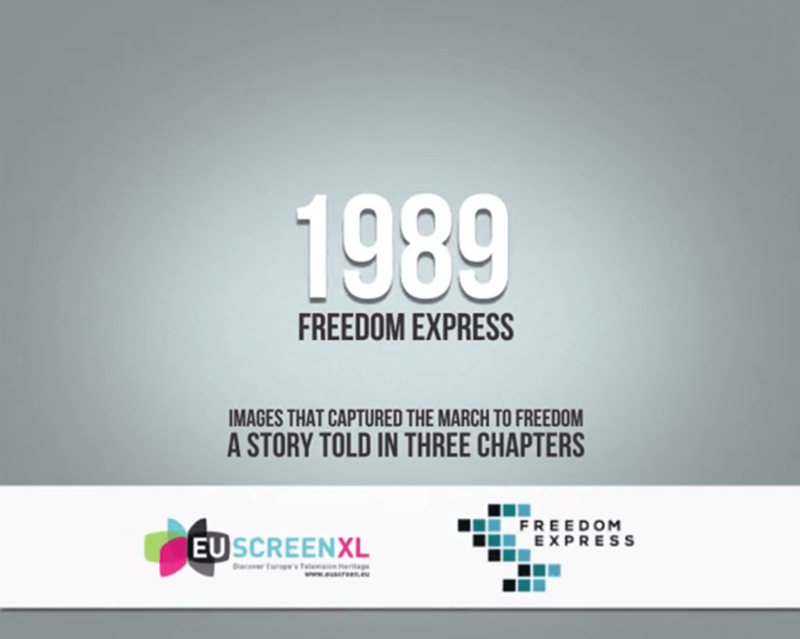 EUscreenXL becomes a partner of the socio-educational ‘Freedom Express’ campaign, commemorating the political transformation of 1989 in Central and Eastern Europe. On August 25th in Warsaw, the plans for the campaign were announced during a press conference. The Freedom Express is organised by the European Network Remembrance and Solidarity in collaboration with multiple respective European partners including Europeana and EUscreenXL. The campaign is designed to be a reminder of the fundamental meaning that the revolutions of 1989 had on the identity of Europeans living on both sides of the former Iron Curtain. The tour will take 20 young historians, journalists and artists through European countries following the footsteps of 1989. The expedition already started on 30 August in Gdańsk, Poland. Its participants will also visit Hungary, Romania, Slovakia, Czech Republic and Germany, where the journey will end on 13 September in Berlin. Their journey can be followed on the blog on the project’s website. An important part of the campaign will be an outdoor, travelling exhibition ‘Roads to 1989 – Year of Change, East Central Europe 1939-1989’. It highlights the political and social processes that led to the division of Europe into two spheres of influence, and then tells the story of the different paths that led Central European nations to freedom and democracy presenting the unique changes that began in 1989. EUscreenXL contributed to the exhibition by creating a unique and historically meaningful video production. It includes content that shows important and commonly recognizable personalities and events from the political transformation time in Europe and depicts crucial social phenomena also typical for the period. The production has been divided into three short chapters – social movements, first political actions and important personalities & political breakthroughs. 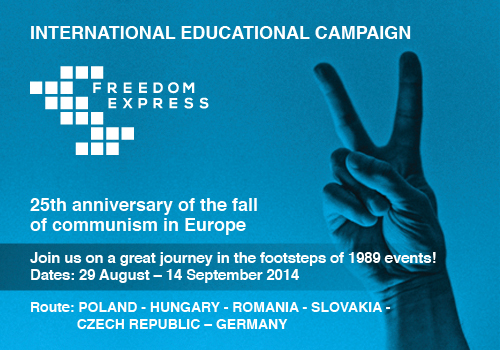 In October and November the first presentations will be held consecutively in Berlin, Budapest and Warsaw. The exhibition in the virtual version will be also available on the campaign website. Seven EUscreenXL partners – Deutsche Welle, The Lithuanian Central State Archive, RTV Slovenia, Czech Tevision, National Audiovisual Archive of Hungary, National Audiovisual Institute of Poland (in collaboration with Video Studio Gdańsk), and The Netherlands Institute for Sound and Vision contributed to the project. The Freedom Express project is unique to the EUscreen consortium as it represents one of the first try-outs of the EUscreen Network activities aimed at reaching new audiences and stepping out of the online world by preparing a physical exhibition. It also opens EUscreen to collaboration with third party institutions – European government bodies, important European memory institutions and creative industry representatives.